To Market, To Market | Aurora Shoe Co.
We're excited to share that the Aurora Shoe Company has been selected as a featured business at the Poppytalk Handmade Marketplace. 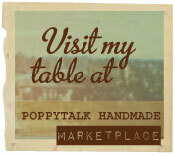 Check out our virtual table and all of the other handmade and vintage goodness that surrounds us. Visit the Poppytalk blog later this month to read our post about the value of buying locally sourced and handmade products.